Issue 358 of the magazine Steam Railway carried an article on Brunel's GWR on its page 12, inspired by an interview Watchdog's Vice-Chair had with one of their reporters. The magazine has kindly given permission for the article to be reproduced on the Watchdog website, but unfortunately a scan of the magazine page is too big for a dial-up connection, and a web page does not lend itself to reproducing the magazine format on screen. So we have copied the text verbatim, but have rearranged the layout so that it is easy to read on screen. This is the article, for which Steam Railway retains the copyright. GOVERNMENT proposals to nominate Isambard Kingdom Brunel's Great Western Railway main line for UNESCO World Heritage status have been dropped following a change of direction on its World Heritage policy. Selected parts of the Paddington to Bristol route were initially added to the Government's 'Tentative List' of potential World Heritage Sites in 1999. The list included 25 sites that would be put forward for consideration by the UNESCO World Heritage Committee - to date, nine of these sites have been awarded World Heritage status, the highest level of heritage protection. However, UNESCO has made it clear that it wants more sites from developing countries to be included on the World Heritage register, and therefore would like to see a slowdown in nominations coming from Europe. This, together with a planned Government review of its World Heritage Policy, means that the existing Tentative List may be dropped after 2010, and the Government will not make any commitments to World Heritage nominations until after the review is completed. "The current commitment is to nominate Pontcysyllte Aqueduct and its canal, re-nominate Darwin at Down and to nominate Monkwearmouth and Jarrow Monastic Site. The government will not make any future commitments to nominate sites until it has completed a review of its World Heritage policy. " "Should the Government decide to revise the current UK Tentative List, appropriate guidelines on applications for inclusion on a new List will be made available. It is probable that any site on the current Tentative List will have to be proposed afresh as there will not be an automatic right of inclusion for these sites on any proposed new Tentative List... there are therefore no current plans to take forward the nomination of the Great Western Railway." Only a handful of railways around the world have been designated as World Heritage Sites. These include the Mountain Railways of India (Darjeeling Himalayan, Kalka Shimla and Nilgiri Railways), the Semmering Railway in Austria and the Rhaetian Railway in the Albula, Italy/Switzerland. Of 25 World Heritage Sites in the UK only six are industrial, and not one is based on the railways. Brunel began constructing the Great Western Railway in 1835, and the sections included in the Tentative List include such 'pearls' as Paddington station, Wharncliffe Viaduct, the Maidenhead Bridge, Swindon railway village, Wootton Bassett incline, Box Tunnel, Sydney Gardens and Bristol Temple Meads train shed. "Bath is extremely fortunate in having one of the eight 'pearls' on the 'necklace' of the Great Western Railway. Bath Heritage Watchdog is extremely concerned that the nomination is not being put forward and may not be included in the future list. This is woeful and to our mind shows an absolute lack of commitment to our vitally important industrial and social history." The decision of the Government may not just affect the Great Western Railway, as it puts into question the validity of putting any other UK railways, such as the Liverpool & Manchester or Ffestiniog Railways, forward for nomination in the future. Picture: On December 6, a GWR 'King' No. 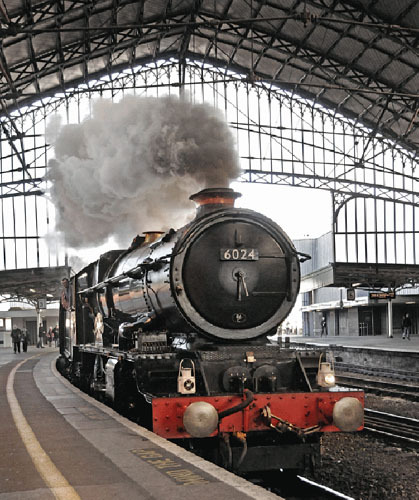 6024 King Edward I steams into Isambard Kingdom Brunel's train shed at Bristol Temple Meads during its sojourn on Past-Time Rail's 'Torbay Express' runs. THE news of the Government's decision to halt progress with the GWR World heritage nomination comes just weeks after Network Rail unveiled plans that could see major modifications to Reading station, including a new steeply graded flyover. The £644m project has been proposed to eliminate the bottleneck that Reading creates, and would see five additional platforms added, two existing platforms lengthened, an additional entrance installed and, more controversially, a 1-in-100 graded flyover (current plans have it as 1-in-90) to the west of the station over new freight chords. This section of the Great Western was affectionately known as 'Brunel's billiard table' because of its easy grades, with the climb rarely topping 1-in-754. The flyover would be just short of a mile in length, and just within the capabilities of the First Great Western 'HSTs' that currently ply the route.